Surrounded with the beautiful landscape, Trebon is one of the very inte-resting towns in the southern part of the Czech Republic. Many visitors come every year and enjoy its original charm. The name Wittingau and Wittigenove was already used like the name of the town in 1341, the name Trebon is existing since 1366. 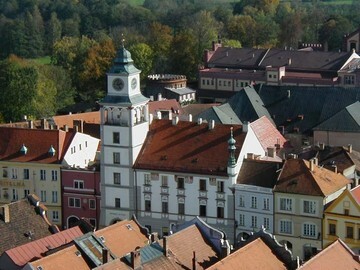 Under the reign of Rozmberks, in 16th and 17th century, the town gained a great prosperity. Between 1660 and the beginning of 20th century was the town in possession of the dynasty Schwarzenberg. Trebon is also a well-known spa. The town is situated in the heart of a UNESCO Biosphere Reserve.